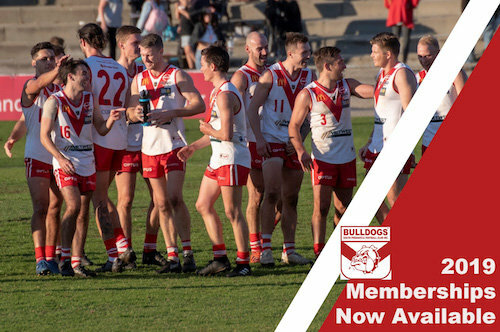 SOUTH Fremantle remains at Fremantle Community Bank Oval this Saturday following the bye to host an East Perth team on a five-game losing run but the Bulldogs need to keep winning to retain second position on the WAFL ladder. South Fremantle and East Perth first played one another back in Round 7 this season straight out of the State game break and at that time, both teams were on impressive four-game winning streaks and were battling over second position on the ladder behind Subiaco. The Bulldogs won that day by 68 points and have consolidated second position on the ladder since with a 7-3 record prior to last week's bye after a 35-point win at home against Peel Thunder. For East Perth, however, that loss to the Bulldogs was the start of its current five-game losing streak and the Royals are only just clinging to fifth position on the ladder by percentage with a 4-6 record. 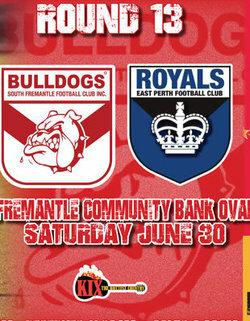 A win on Saturday at Fremantle Community Bank Oval for South Fremantle and the Bulldogs will at least remain percentage clear of the third placed West Perth, and potentially a game and percentage ahead unless the Falcons are able to pull off the upset and beat Subiaco at Joondalup Arena. It's a huge game for East Perth too with the Royals needing a win to stop their five-game losing slide to remain inside the top five. A win and East Perth could even improve to fourth position should Swan Districts lose to Peel Thunder in Mandurah. But a loss and should Claremont beat East Fremantle and Peel beat Swans, then East Perth could slip down to as low as eighth position on the WAFL ladder by Saturday night dependant on percentage. As well as that win over East Perth in Round 7 of this year, South Fremantle did beat East Perth by 30 points in Busselton late last year and have won three of the past four clashes against the Royals. But prior to this run of winning three of four games, the previous six matches between South Fremantle and East Perth saw a different winner each time they met and all signs point to another fascinating battle on Saturday. Last time they met at Fremantle Community Bank Oval was Round 10 last year and East Perth pulled off a one-point win against South Fremantle with a team loaded with West Coast talent, particularly talls, and it was Drew Petrie who kicked the winning behind in the finish. 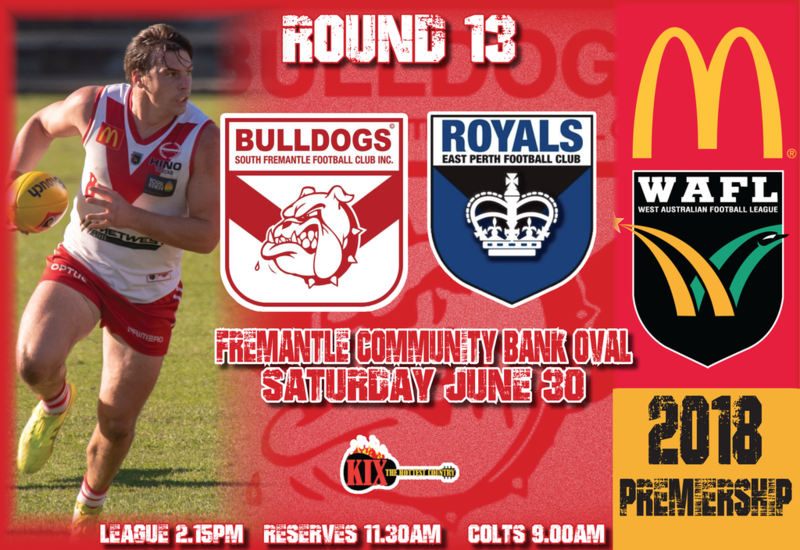 South Fremantle is coming off the bye last weekend and prior to that had a solid 35-point win against Peel Thunder. From that line-up, no player has gone out at this stage but vice-captain Mason Shaw will still need to prove fitness after pulling up sore on his very last kick during the warm-up against Peel meaning he took no part in the game once he came to the bench in the opening minutes after starting on the ground. 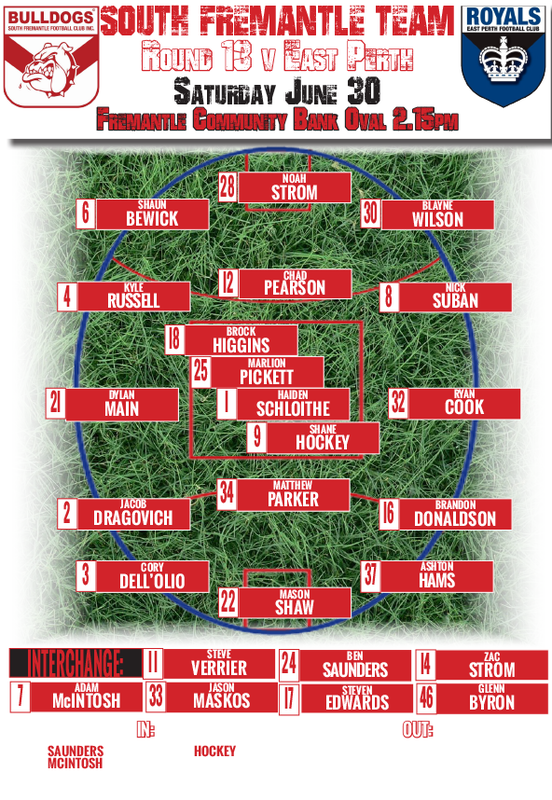 But no South Fremantle player has been named out of that 22 at this stage with three players with plenty of experience and quality on the inclusions list, Ben Saunders, Adam McIntosh and Shane Hockey. Saunders hasn’t played since injuring a hamstring in Round 7 against East Perth with the triple Bernie Naylor Medallist now set to be back to strengthen a forward-line that looks like it will be without Blaine Johnson for the rest of 2018. Johnson was South Fremantle's leading goalkicker in 2017 booting 59 goals and he has kicked 105 goals in 52 matches for the Bulldogs since returning from time with Carlton in the AFL. But he has now signed with Baldivis in the Peel Football and Netball League. Hockey was a late withdrawal for South Fremantle against Peel meaning he's missed two of the past three matches while also being out for most of the Round 8 loss to Claremont through concussion. But he's averaging 26.1 disposals a game outside that and will be a welcome addition to the midfield on Saturday against East Perth. Then there is McIntosh with the experienced 104-game defender having a slow start to the season following an interrupted pre-season. But he was back to his best in the reserves two weeks ago to put himself back in the mix for a league call up. 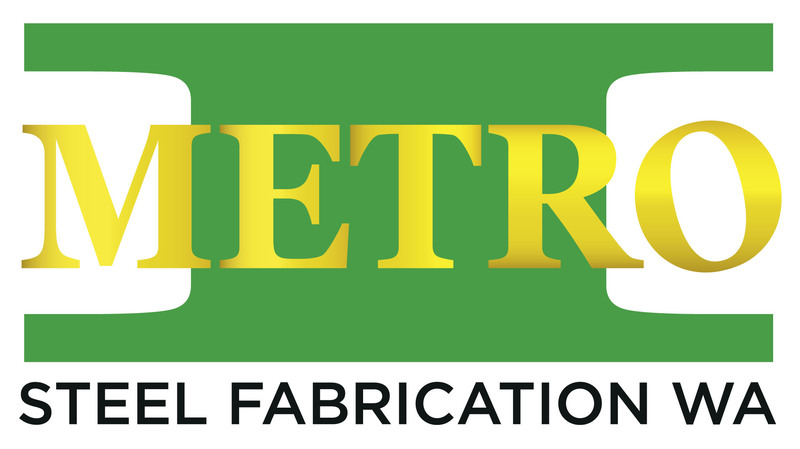 East Perth has now lost five straight matches including in disappointing fashion to Claremont last Saturday on home soil, and the Royals will have plenty of changes to their line-up against South Fremantle this Saturday at Fremantle Community Bank Oval. In terms of West Coast-listed AFL players, East Perth will regain Jackson Nelson and Hamish Brayshaw while Tarir Bayok could have earned a call up after spending time in the reserves. Brendon Ah Chee and Brayden Ainsworth are out for the Royals and will play for West Coast against Adelaide at Adelaide Oval on Saturday afternoon while Matthew Allen is the travelling emergency. Christian Ameduri, Mitch Dobson, Nathan Eaton, Shayne Hille, Taylor North, Tony Olango, Jamie Rudrum and Asher Samelko have been all included in the East Perth squad as well. Callan England and Josh Rotham have been named out for East Perth as well.